Caterpillars are on the move at the San Francisco Botanical Garden. Visitors are warned to proceed with caution as 100’s of small caterpillars feast on their only food, the California Pipevine. California Pipevine Swallowtail Butterflies are endemic to northern California and are very rare. 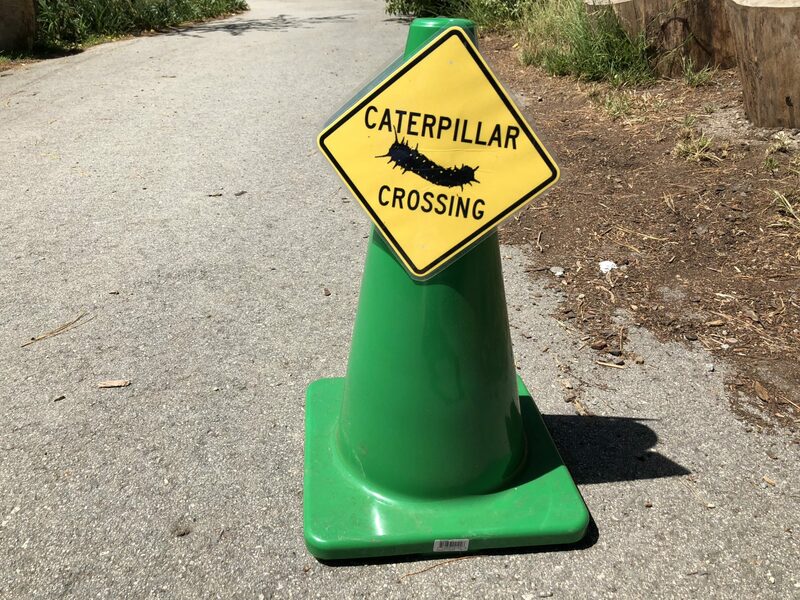 The Botanical Garden pulls out the cones and warning signs to protect the species while they are in the caterpillar phase. These small but mighty black and orange caterpillars are racing to eat as much Pipevine as possible to help them transition to beautiful black and blue butterflies. Stopping to watch these voracious animals is a lesson in appreciating small but mighty. When you look around what do you notice as small and mighty? Is it a small Barn Swallow diving and dipping to gather as many insects as possible to feed a nest of hungry, mighty mouths in the nest? It it a local nonprofit that operates on a small budget yet has a powerhouse of employees and volunteers who are championing the mission of the nonprofit? Is it a small group of individuals at a school or place of worship that is championing preparing meals for individuals without housing? Is it a kickstarter initiative where a small but mighty group of French Horn players is trying to raise enough funds to get a group of women to a French Horn festival in the midwest this summer? Once you start looking around you’ll notice small but mighty initiatives all around. Take a moment to look at your community, workplace and family to notice the small and mighty. How might you adjust your lenses to notice the energy and focus of these small and mighty initiatives and people? How might you show appreciation? What orange warning cones might you put up to remind people to slow down and notice the small and mighty in your office, home and community? It takes energy, commitment, and focus to be small and mighty. Let’s support all the small and mighty together!